What is prosperity? Explain fully. What is matter? What is the distinction between substance and matter? What relation does divine substance bear to man's supply? Explain the meaning of the Scripture, "Seek ye first his kingdom, and his righteousness; and all these things shall be added unto you." Matt. 6:33. How may one become conscious of substance? Give three affirmations of your own for the realization of divine substance. Explain fully the law of giving and receiving. How may we overcome worry about supply? Why does the apparent source of income sometimes stand in the way of one's knowing God as his bountiful and ever present supply? What is the true object of all work? What has faithfulness to do with demonstrating prosperity? What is the relation of praise to the manifestation of supply? When you give to another or do something for him, why should you trust divine law for recompense, rather than expect compensation from him? How would you build a consciousness of prosperity? 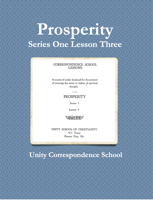 The first question that presents itself in the study of this subject is, "What is prosperity?" In this lesson we shall seek to find the true meaning of the word. To find the true meaning of prosperity we must get away from the belief of limitation in the realm of appearances and into an understanding of reality. In cleansing the soul-consciousness of false beliefs concerning prosperity, the first to be erased is the belief that possession of things only constitutes prosperity. Such a belief is a false concept and has no place in Truth. My understanding is quickened by the word of Truth, and I no longer believe that prosperity consists only in possession of things. These are but manifestations of the inner working of ideas in mind. I acknowledge God, Divine Mind, with all its inhering ideas, to be my unfailing and unlimited resourse. Substance is not so generally recognized as some of the other attributes or ideas of God, such as life, love, wisdom and power, but it is very necessary to the well-being of man, and it should be recognized and studied and used. Substance is Mind Essence, the body of God; it is Omnipresence, all penetrating, all potential, all intelligent, all providing, all sustaining, everywhere present. It is the foundation of the universe, all things being formed from it, the structure upon which all things are made; it is that in which ideas live and move and have being just as a fish lives and moves and has being in water. Although substance or Mind Essence is invisible and intangible to the outer eye of manifest man, man has the power of thought or of image-making by which he can attune himself to Spirit and by this mind activity come to see and feel divine substance as a living reality. From this living reality or substance man forms in his mind mental images or pictures of whatever he wills or desires, whatever he thinks or feels. These forms then take shape in the outer or physical realm as things, circumstances and conditions and are known as formed substance, matter or material things. Matter, or manifest objects, is formed substance. It is an effect or the form or appearance of substance or Mind Essence in the physical realm after it has been handled in the mind or consciousness of man by his thought or image-making power. Both substance and thought power are absolutely good. Man as a spiritual being is given absolute freedom to use them as he chooses. So matter or the form or appearance of divine substance on the physical plane is dependent upon man's understanding and use of substance. Man therefore becomes a secondary cause in producing events and things in the manifest realm. Whatever the form, the condition, the thing that appears, it has been formed or produced out of spiritual substance and this Mind essence always pervades it. The substance or Mind essence never changes, but the form or appearance of things and conditions change according to the understanding and use of man's thought power. Man is in a state of becoming conscious of himself as a spiritual being. He is growing and unfolding in understanding of his Christ dominion and mastery through right use of his image-making power. Many of his thoughts and actions show that he has not yet attained the highest consciousness of perfection, a consciousness that is his divine heritage. It shows that he does not always form, make or produce out of divine substance (body of God) that which accords with the character and nature of God, which is Absolute Good. The appearances in the manifest realm are not always in accord with the divine idea that lies behind them. Jesus instructed us against taking appearances as the basis for our thinking and feeling when He said, "Judge not according to appearance." — John 7:24. Understanding the omnipresence of God, we know that His life and intelligence and substance permeate all things and that there is, therefore no absence anywhere of life, substance, and intelligence. This is a good affirmation to make. It will free the mind from many limiting beliefs. What metaphysicians call substance, natural scientists name the universal ether. "The very air is alive with dynamic forces that await man's grasp and utilization . . . these invisible, omnipresent energies possess potentialities far beyond our most exalted conception. What we have been taught about the glories of heaven pales into insignificance compared with the glories of the radiant rays – popularly referred to as the ether. We are told by science that we have utilized very meagerly this mighty ocean of ether in producing from it the light and power of electricity. The invisible waves that carry radio programs everywhere are but a mere hint of an intelligent power that penetrates and permeates every germ of life, visible and invisible." – Charles Fillmore Prosperity 10. Substance contains all the elements in a rarefied state. "Form" or matter is substance condensed so that it is visible in a three-dimensional world. That which is real to a metaphysician is that which is permanent, substantial, enduring. Organized forms or bodies in the manifest world are not permanent and enduring, but the elements of which they are composed are resolved back to the rarefied state from which they came; thus nothing is ever lost or destroyed in Spirit. All is God and God is all. Should we take a piece of ice, put it in a vessel, and raise the temperature the form of the ice would disappear and we would know the substance as liquid, water. Still raising the temperature, it would next become steam and would float away as gases out of the sight of the physical eye. Because it is not visible to the physical eye does not mean that it has been destroyed or lost; it has simply been transformed from a solid, dense state to a lighter and more rarefied one. Solidification of a thing is due to a decrease in the rate of movement of its particles. In the physical world this movement is known as vibration. The higher the rate of energy the more nearly invisible the substance is, until finally it is not comprehended by the physical eye. The highest rate of movement is in mind, in what we term consciousness, the activity of the invisible substance. One definition that Webster gives of substance is: that in which properties inhere. Unity refers to it as "thought stuff," "mind stuff," the raw material out of which all things are made. God being infinite Mind, then the substance of God would be all the ideas inhering in Divine Mind; a spiritual aggregation so to speak, of all the qualities or attributes of God; the universal supply of all good; the source of all that is manifested or unmanifested. Everything begins in mind; ideas are the cause of all that appears in the manifest; ideas are the builders. We have stated that substance is the body of God or Omnipresence, and the admonition is, "Take, eat." – Matt. 26:26. All the ideas which inhere in Divine Mind are ours to appropriate and use in whatever combination or form we desire. We may take substance in the form of life, in the form of love, in the form of power, in the form of strength, in the form of faith, in the form of prosperity – whatever we feel that we are needing. We have the privilege also of combining these ideas in any way we choose. Substance then is the essential foundation, or that which stands under all visible things. The first emanation of God Mind, the first "God said," – Gen. 1:3, of creation, is light; and so if we would rightly combine these ideas which are the body of God we must not only have that which stands under but also light, that which understands. Otherwise we bring in to the manifest world that which is imperfect or incomplete, that which is far from satisfying. Explain the meaning of the Scripture, "Seek ye !rst his kingdom, and his righteousness; and all these things shall be added unto you." Matt. 6:33. An understanding of God as substance forms the foundation of true spiritual prosperity. Those who know God in this manner have an assurance of unfailing supply. By understanding and faith they lay hold of the one substance and bring it into manifestation according to their need. By acknowledging and praising God as substance, the mind is opened to ideas inhering in substance which then flow into consciousness as a great stream of bounty. This explains why Jesus said, "Seek ye first his kingdom,~and his righteousness; and all these things shall be added unto you." – Matt. 6:33. He knew the one source of supply and He lived constantly in the consciousness of it, and He was pointing it out to man. It also explains why He said, "Lay up for yourselves treasures in heaven. – Matt. 6:20. The inexhaustible source of mind essence or substance is available at all times and in all places to those who have learned to lay hold of it consciously. Thus they build a consciousness of rich ideas which is true prosperity. In the first lesson we learned that God is everywhere equally present, conscious union between God and man is made within the mind or consciousness of man. Man realizes all of God's attributes or ideas only as he gets still and comes into conscious union with Him in the "secret place." – Psalms 91:1. So it is with substance; the only way to know about substance for oneself is to go within and get direct conscious union with it by affirming its presence, its reality, its power, and the possibilities that it contains for man. This may be done by using "I AM" affirmations, which is the right use of the creative power of God, the I AM, the Word or Christ. Then substance will be seen with the eye of faith. "Faith is the perceiving power of the mind, linked with a power to shape substance. . . in other words, faith is that consciousness in us of the reality of the invisible substance and the attributes of mind by which we lay hold of it." – Charles Fillmore Prosperity 43. In this way man becomes conscious of substance as a living reality which he can intelligently direct and wisely use to satisfy his every need. One should not be kept from acknowledging substance because he is not at first conscious of it; he should affirm its presence because he has the understanding that it is. God did not create the universe out of nothing, but out of His very own Spirit substance. Man cannot make something out of nothing. The clearer his understanding of substance out of which he makes things, the better he will be able to bring forth whatever good he desires. Then he will not be deceived by the thought that things are the source of his good. "The spiritual substance from which comes all visible wealth is never depleted. It is right with you all the time and responds to your faith in it and your demands upon it. It is not affected by our ignorant talk of hard times, though we are affected because our thoughts and words govern our demonstration. The unfailing resource is always ready to give. It has no choice; it must give, for that is its nature. Pour your living words of faith into the omnipresent substance, and you will be prospered, . . . turn the great energy of your thinking upon 'plenty' ideas, and you will have plenty regardless of what men about you are saying or doing." – Charles Fillmore Prosperity 13. Substance never fails. It is as eternal as God is eternal, and is always ready for man's use. It is the "inheritance incorruptible, and undefiled, and that fadeth not away." – I Pet. 1:4. It means something to inherit from God, and happy are they who can say with understanding, "All things whatsoever the Father hath are mine." — John 16:15. It was out of substance that Jesus multiplied the loaves and fishes. He understood it as all-potential, everywhere present, and intelligent and instantly responsive. He had faith in it and he showed by His example that it can be brought forth into manifestation by prayer and thanksgiving. We live, move, and have our being in the sea of substance. There is a law that substance must have both an inflow and an outflow; this we call the law of giving and receiving. Substance flows into consciousness where it is given form according to the faith and the understanding of the receiver; then it must be given out in blessing in whatever form he is able to express it. People sometimes say, "I have nothing to give," but they do not make such statements after they come into the understanding of Spirit substance. There is Spirit substance in words of Truth, and one may begin giving it in that form. Those who seem not to have in hand the good with which they desire to bless others can give that good in words and the outward manifestations will come. There is, therefore, a good reason why one should pray for others. If he affirms good for them, he is praying; and "The effectual fervent prayer of a righteous man availeth much." – James 5:16. The substance of true words is seed, and the harvest will be rich with increase to all who recognize that their seed words contain life, substance and intelligence. These constructive, joyous, praise-filled qualities in words of Truth make them powerful in demonstrating prosperity, health, protection, guidance, or whatever else is desired. Prosperity is the law of increase in action. Dear Father God, I have faith in Your ideas as the source and the substance of all my good. I have faith in this substance as it is now manifesting in me and in my affairs. I have increased bounty through my increasing faith in You, dear God as my Father and my support and supply. I praise and bless You, O Spirit of Plenty, for the fullness of Your supply. I am free from the care and the burden of thoughts of lack because I am quickened to the consciousness of abundance of all good. I praise and give thanks dear Father God, for this freedom. I have an inheritance incorruptible and undefiled. Your ideas are my inheritance, O blessed Spirit of Plenty. The fact that there is a law of giving and receiving needs emphasis, because many have hindered their demonstrations of prosperity by an unwillingness to give, while others have shut off their supply by an unwillingness to receive. The first fault is usually caused either by selfishness or by a belief in lack; the second fault by pride of some form. Whatever may be the error the overcomer must change his thinking and feeling in regard to substance and his relation to it. This is done by a conscious practice of denial, affirmation, meditation aand prayer. Selfishness is overcome by giving up the false concept of the source of all good and by realizing that the great universal substance is free and open to him and to all persons. Pride is a form of selfishness. Beliefs of lack are eliminated by the recognition of the one substance, everywhere present constantly responsive to all demands made upon it. Prosperity comes, not by chance, but in accordance with absolute laws. There is no such thing as luck. The law is universal and even those who are ignorant of spiritual things sometimes blindly set it into operation for a time. Such an experience they call a "streak of luck." If they would study the law and obey it intelligently and willingly, it would work for them continually and their prosperity would be permanent. They would not judge prosperity by the outward appearance, but by the inward consciousness of plenty, and thus they would be satisfied; the outer would correspond to the inner and there would no longer be an appearance of lack. All anxiety concerning supply is removed by knowing God as the Source of supply. Health is another form of prosperity, and it would in many cases spring forth speedily if anxiety were overcome, because many people suffer both in mind and in body from belief in lack and from consequent worry. The habit of praise for the fullness and richness of God's bounty will lift men out of a consciousness of lack caused by not knowing God as Father and supply. In the past it was generally believed that it was God's will for men to be sick and poor; but great light has come to the race, and such errors are fast being dispelled. God's promises of prosperity are so numerous in the Bible that it seems strange that they could have been overlooked. It is sometimes said that Jesus was poor, but such a word is surely a misnomer when applied to a man who could demonstrate supply as Jesus demonstrated it. Doubtless He had true riches – the consciousness filled with ideas of God as substance, and He lived in conscious union with God. While yet in an unenlightened state, the mind sometimes firmly holds the belief that supply can come only in a certain way. The channel is looked upon as the source. External supply, such as the weekly wage or the income derived in other ways, assumes large proportions in the mind and shuts out the consciousness of God as the Source of supply. This state of mind can be changed by denial of the error and by affirmation of the Truth. Challenging brain and heart and hand? Thank God for the splendor of work! The true object of work is the expression of all of man's God-given faculties and powers and service to his fellowman. The race is a unit and every man is under obligation to all men. This obligation is not an arbitrary matter fixed by some tyrannical God or by some unfeeling law; it is the obligation of love. Love is the law that unifies the race and adjusts all people in righteousness and establishes harmonious relations. Discords come from violation of the law of love; when men work for a living instead of for the purpose of expressing their powers in righteousness and rendering loving service to their fellowmen, they interfere with the operation of divine law. Co-operation instead of competition is the secret of success, because co-operation fulfills the law of love. Sometimes prosperity is not demonstrated because of unfaithfulness in work. The reason is not that labor is the source of prosperity, but man has not worked in harmony with the law of loving service. Whatever the work may be, the whole heart should be put into it and it should be well done. Fault-finding, complaint, or dissatisfaction with one's occupation makes a poor workman. When dissatisfied with one's work, one cannot do his best. The compensation is poor because he has not observed the law of giving and receiving. "You demonstrate prosperity by an understanding of the prosperity law and by having faith in it, not by appealing to the sympathy of others, trying to get them to do something for you or give you something. Faithftilness and earnestness in the application of the prosperity law will assure you of success" – Charles Fillmore Prosperity 50. "In all thy ways acknowledge him and he will direct thy paths" – Prov. 3:6. If you cannot see in the work you are doing an opportunity to help others, change your work; but unless you are doing that which is directly harmful to men you can always feel that in some respect, however slight, you are benefiting mankind. The woman who makes clothes, the man who farms, and the miller who grinds are all doing their share of the world's work. Do your part and be glad. If you are not doing so much as you would like to do, rejoice and give thanks for the privilege of doing the little and the larger opportunity will come – but it never can come through your finding fault with your opportunities. Blessing and praising the good increase your consciousness of good. Praise is cumulative. Man magnifies and expands that which his mind dwells upon with approval. As he mentally sees how valuable anything good is, it naturally increases in worth. The law of giving and receiving is innate in man's being, as is shown by even his blind attempts to observe it. If another does something for him he feels the obligation to do something in return. The use of money is a blind attempt to keep the law of giving and receiving, and it is a convenient means in the present stage of the world's advancement. If Mr. Smith renders a service to Mr. Jones, Mr. Jones may not be prepared to return the favor directly, but he gives to Mr. Smith a certain sum of money representing his idea of the value received from Mr. Smith. Mr. Smith can use the money to make a satisfactory exchange with some other man for something he needs. So it goes on right under our eyes all the time; the law of giving and receiving is being used, though not always in its perfection. When men fully understand the law of giving and receiving and their relation to one another, they will know that ideas and not money are the means of fulfilling the law and they will demonstrate that "love therefore is the fulfillment of the law." – Rom. 13:10. "Love is one of those ideas which provides a key to the infinite storehouse of abundance. It opens up generosity in us. It opens up generosity in others when we begin to love and bless them. Will it also open up a spirit of generosity in God? It certainly will and does. If you consciously love and bless God, you will soon find that things are coming your way. It will surprise you that just thinking about God will draw to you the things you want and expect and bring many other blessings that you had not even thought about. Thousands of persons have proved this law to their entire satisfaction. . . This law will demonstrate itself for you or for anyone who applies it faithfully, for 'love never faileth.'" – I Cor. 13:8 – Charles Fillmore Prosperity 108. Money is not an evil in itself; it is the selfish use of money that makes trouble. Money is not a curse to those who see the place that it fills and keep it in its place. "Money was made for man and not man for money." – Charles Fillmore Prosperity 184. When they know that substance and not money is the source of their good, they will not be grasping and selfish. The term "uncertain riches," refers to the possession of things apart from the consciousness of one substance as the source of all; "uncertain" possessions are the ones that cause vexation and sorrow. As men come into the consciousness of the universal law they will give in love and receive in love, and everybody will be satisfied with that method of keeping the law. Instead of considering money as a cold, hard, material thing, see it as formed substance, the symbol of the inexhaustible idea of substance and the means that men are using to keep the divine law of giving and receiving. Money is not to be hoarded, but is to be kept moving. All who understand true prosperity keep the law of giving and receiving. All who take the right attitude toward money have plenty of it. It flows into their hands in a constant stream of blessing. They know that it is formed substance, the symbol of the inexhaustible idea of substance, and they come to understand and use money wisely as a medium of exchange. In the matter of giving, it is well to remember that the law of giving and receiving is universal and not personal. You should not be disappointed if those to whom you give do not recompense you, and you should not be anxious because you feel that you cannot give to those who do something for you. The law will take care of all that. The unchangeable law is, "Give, and it shall be given unto you." – Luke 6:38. The exact way in which the return shall come is not specified. If you serve your neighbor, it may be that the most direct way for you to receive will be for him to do something for another. "We must not try to fix the avenues through which our good is to come. There is no reason for thinking that what you give will come back through the one to whom you give it. . . The law will bring each of us just what is our own, the reaping of the seeds we have sown. The return will come, for it cannot escape the law, though it may quite possibly come through a very different channel from what we expect. Trying to fix the channel through which his good must come to him is one of the ways in which the personal man shuts off his own supply. The spiritual-minded man does not make selfish use of the law but gives because he loves to give. Because he gives with no thought of reward and no other motive than love, he is thrown more completely into the inevitable operation of the law and his return is all the more certain. He is inevitably enriched and cannot escape it." – Charles Fillmore Prosperity 143-144. In this lesson, ideas have been presented to help one build a prosperity consciousness and the first step in this activity is a desire to come into a feeling of conscious oneness with God, Divine Mind, Omnipresent substance, the Source of all good, and the basis of all supply. All men, to some extent, desire to have an abundance of good, to have peace of mind, and health of body, but they have not realized that all these have their foundation in God, and that they cannot have the gift without the Giver. So the first step in building a prosperity consciousness is to recognize the importance of desiring to have a conscious feeling of oneness with the infinite resource, which is God, Absolute Good. As one heeds the call of his heart's desire, he will turn within to his own indwelling Father, the great storehouse of divine ideas, the kingdom of God, and make this his abiding place. He will consciously abide or stay in that place within himself and make conscious union with the idea of divine substance. He will contemplate substance, he will meditate upon it, he will affirm its presence and through the right use of the creative power of God which can be directed by his thoughts, feelings and words, he will, in faith, begin to image himself molding and shaping the everpresent substance of mind, or "thought stuff" into peace of mind, health of body and an abundance of all good of which he feels that is needful to him and to others. In faith he sees himself as well and happy, peaceful and joyous. He praises God for his ability to recognize and to feel the goodness in which he is abiding. He praises God for divine substance that fills every need. He praises and gives thanks to God for the right attitudes of mind that are now flooding into his mind and heart, feelings of kindness, generosity, love and appreciation for all persons and things. His world begins to change. He has that feeling of well-being in every phase of his life, for there is no lack of any good thing in his life. He understands his source of all good and he knows that "All things whatsoever the Father hath," – John 16:15, are his to use, to enjoy and to share. The more conscious one grows of God as the inexhaustible, everywhere present substance that is instantly responsive to any demand made upon it, the less he will feel limited in any way. He will know that he is blessed with the great privilege of giving and of sharing this substance with all people. He will give freely and cheerfully of his consciousness of abundance, of peace, joy and good-will. His very life will be a blessing to all who come in contact with him. He will have the right attitude toward God, toward himself and the world in general and it has been said that the whole universe is behind the one who has the right attitude, and we know that God is behind the universe sustaining it in divine substance. Till hope in your soul is born. You may call to the soul of you." God bless you, dear one, as you give your thought and word power to building a consciousness of prosperity, which is the consciousness of eternal well-being here and now. Knowing that we are building our eternity."